Chicago jazz fans, musicians and critics knew Eddie Higgins. 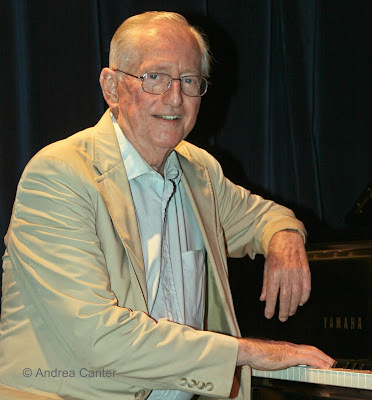 Knew him as one of the most elegant and swinging of bebop pianists, and by various accounts also one of the most engaging and personable. He had a long stint at the famed London House and was well known at the Windy City’s favorite jazz haunts of the 50s and 60s. Originally from Cambridge, MA, he ultimately split his time between Cape Cod and the Fort Lauderdale area in semi-retirement. 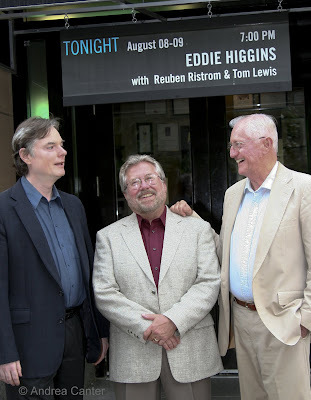 Like much of the world outside Chicago, I had not encountered Eddie Higgins until relatively recently. A bevy of recordings brought him more attention in the last decade or so, and in 2001 he recorded a live trio set at the old Dakota in St. Paul, featuring bassist Brian Torff and local guitar king Reuben Ristrom. I vaguely recall being in the audience that night and finding his swinging piano a great antidote for a long day at work. A few years later he returned to repeat the act, this time recording with Reuben and bassist Tom Lewis at the Dakota’s new digs in downtown Minneapolis. The late Tom Keys was involved in producing the recording and recruited a couple local photographers to contribute to the project. Howard Gitelson and I spent some time posing the musicians and shooting their performance, and in the end a few of my shots made it onto the CD liner. I preferred my out-takes, however! 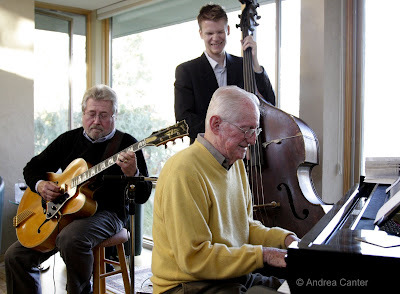 Last fall, Eddie returned for an unforgettably swinging evening with Reuben and bassist Graydon Peterson, which spilled over to a “house party” with his Twin Cities hosts, Mike and Donna Wolsted. Eddie was the center of an afternoon and evening filled with varying combinations of area musicians known for bop and swing, from saxman Doug Haining to vocalist Maud Hixson. The music was enchanting, as was Eddie. Nothing phased him; he responded to each tune proposed with his trademark taste, touch, and elegantly expressed passion. Eddie Higgins passed away in Florida on August 31st at age 77. He’ll be best remembered for his years on the Chicago jazz scene, but here in the Twin Cities we also remember Eddie with great fondness. See http://www.jazzpolice.com/content/view/8541/79/ for a full obit.